Finding the right candidates and getting them in front of your clients faster makes a huge difference to your productivity and your bottom line. Ensuring candidate information is always accurate and up to date makes your CRM or ATS database a hugely valuable resource for all your recruiters. Do you worry that you're wasting time and money by searching for candidates on job boards when they might already be in your ATS or CRM database? When you do find the right candidates, are you spending too much time creating and updating their records? 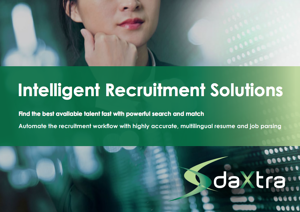 At DaXtra, we have years of experience in developing powerful search and match technology and recruitment automation software. In this download, we give you an overview of our full suite of products and show how they can enhance your recruitment process. unlock the value in your ATS or CRM database by finding candidates however they have been coded. Find out how DaXtra can enable your new hires to start generating revenue faster and help your business to become even more productive.